I absolutely love this book!!! If you are looking for your emotional pendulum to swing like crazy because your feelings are going in every different direction…this story has your name on it! By the time I was done with this book, I was exhausted and needed a drink just to take the edge off. 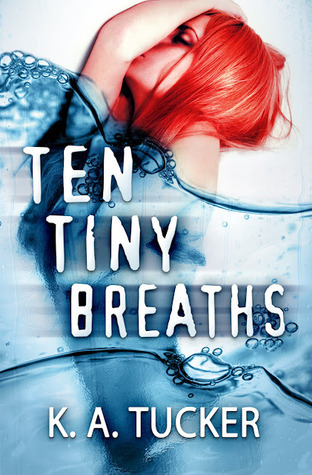 Ten Tiny Breaths is unlike any story you’ve read before and while the topic isn’t new, it’s presented with a twist. Although, some people say that the twist is somewhat predictable, I certainly didn’t feel that way. K.A Tucker can write and she writes so fantastic that you feel as though you are Kasey, the beautiful heroine of this story. I was so lost in this book that I experienced every feeling and thought that Kasey had. I felt her anxiety, her fear, and her loss and above all, I felt the loneliness that plagued her life. The story didn’t bring me to tears but dear gawd I still became melancholy over the unfairness of her life! When Kasey meets Trent the connection is instantaneous but yet their relationship is slow-building. Trent seems like a god-send but there is so much mystery around him that you find yourself guessing what the heck he’s up to the entire time until the big reveal. But the only issue I had with the beginning stages of their relationship was the shower scene moment. It seemed a little out-of-place and maybe even forced, I’m not sure but I thought it was awkward. This story is filled with straight-up trauma and drama, just the way I love my books to be. I loved the supporting characters and I was invested in all of them. Most of all, I was invested in Kasey and Trent and I was rooting for them the entire time. Although, there were moments that I had my doubts if they would make it or not because their story is tragic but it’s incredibly beautiful. My final two cents: this book will grab you from the very beginning and you’ll feel as though YOU need to take Ten Tiny Breaths to recover! It’s really good…I loved it a lot. Let me know what you think after you are done reading it! Loved this book!! I agree it was an emotional roller coaster and I loved the side characters in this book too. I can’t wait to read Livie’s story! Hi Caitlin! I loved it a lot and I loved Livie. Her story needs to be told like yesterday!! !